O hai, it’s a Mockingjay Part 2 app! In a less complicated, cutesy twist, the OLTM (Our Leader The Mockingjay, in case you forgot) app has become MJ2 to promote the final Hunger Games movie. Honestly, not too much has changed. 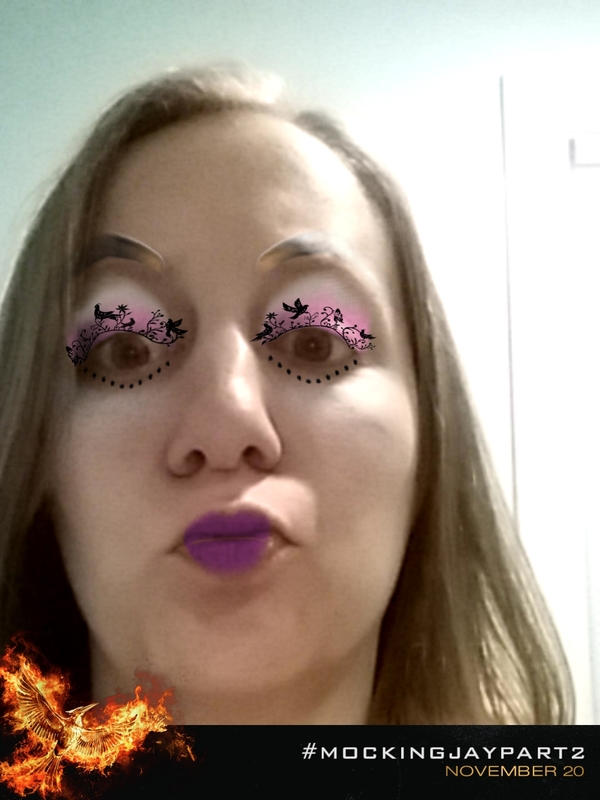 The big new draw is that that graffiti feature has been readjusted for YO FACE! This post contains my face… and for that I apologize. 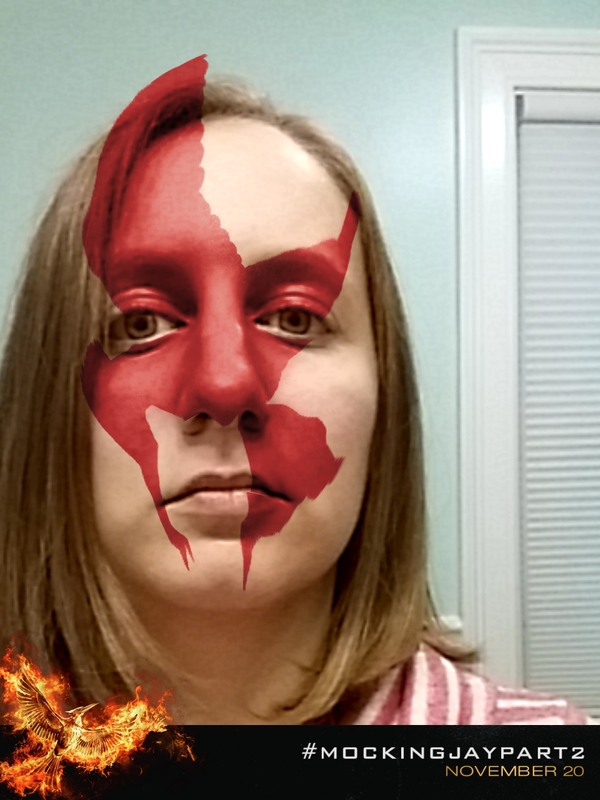 First off, the Mockingjay war paint! Apparently, my forehead is not big enough for this feature. But otherwise, not terrible! Fun fact: You CANNOT smile when you take this picture. Something about the facial shift angers the overlay and it disappears. So go for your war face! Next, you can get into the Capitol spirit and become Effie with a bazillion different make up options. Mind you, all of these options will make you look like an unconvincing drag queen or perhaps a six-year-old who has raided mom’s make-up stash. The stupid duck face WAS intentional. I regret nothing. The old feature has also been given an upgrade. You can still point and shoot at certain clear surfaces to add “graffiti” to your surroundings, but there are plenty of new graffiti options. 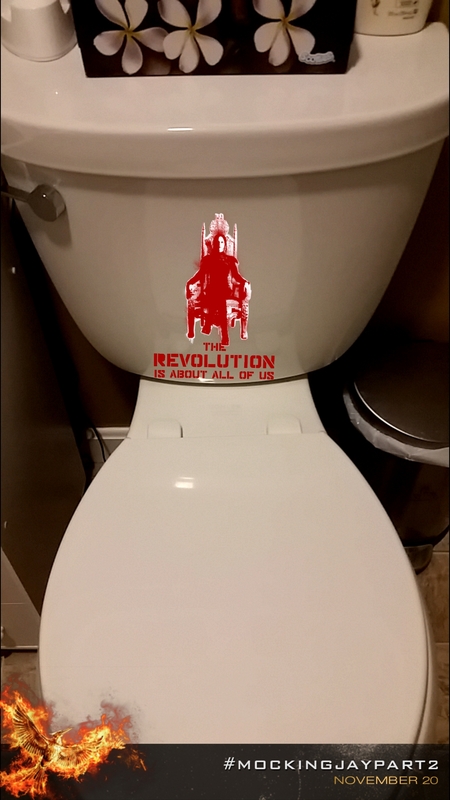 Remember the MockingToilet? IT JUST GOT BETTER. Katniss is on the throne while ON THE THRONE and we are not even a little bit sorry for this. So if you love The Hunger Games and like to go crazy with funny picture sharing on social media, today is your day! Dance through the fields of Internet glory! …But charge your battery first, because this app will kill it in about 5 seconds. ← FANSITE EXCLUSIVE: Watch Two New Mockingjay Part 2 TV Spots!